I hadn’t planned to write again so soon, especially late on a Friday. Once again though, I’m anticipating no Internet access for a while (or electricity, or cable, or phone). I’m staying in Kenner for this storm. Despite the possible lack of amenities, I will be just fine here. Jefferson and Orleans Parishes started encouraging their residents to move back in over the weekend, and I drove from Houston back to Kenner on Monday. Macy accompanied me, as usual. As I had observed during my earlier brief return (9/7/2005), many businesses and residences were heavily battered. In most cases though, I believe the structures should be usable for rebuilding. Many windows remained boarded, most businesses were deserted, and police/guardsmen still patrolled the region. The hurricane clearly hit hard here, but the city of Kenner was more fortunate than New Orleans. Cars traveled the streets, and there were definitely signs of life. I got a sense that we would be back on our feet very soon. At that time, the latest Hurricane Rita was headed for the gulf coast of Texas. The path was steering far west of the Greater New Orleans area. I arrived Monday evening, and helped my friend Robert retrieve a few salvageable things from his apartment. He’s one of the first people I met and befriended from the TGNO program, and he invited me to store a lot of my things at his place after I moved out of my ill-fated New Orleans apartment. Robert, a single dad of a 3-year old boy, grew up in Kenner and lived only a couple miles from me. 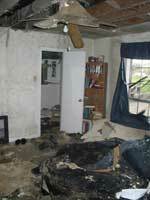 Given the relatively good condition of my place, the tremendous amount of damage at his apartment was shocking. Flooding reached about a foot at most there, but the roof blew off the building and water collapsed the floor of the apartment above his. 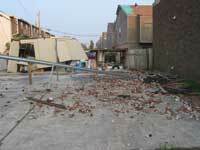 The carport structure next to the building was nowhere to be seen (Picked up and carried away by the winds?). Many of Robert’s possessions were drenched in water, and many more were covered in mold. He lost numerous irreplaceable family photos and pieces of artwork. There used to be a carport here, beside Robert's apartment in Kenner. Robert lived only a couple miles from me, but his apartment suffered so much more damage. Robert grew up in Kenner, and lost a lifetime collection of personal items. Robert picks through his apartment one last time, looking for salvageable items. I initially had been disappointed to find my electricity out when I returned to my apartment. A government map on the Internet indicated that my neighborhood would have power, and many apartments in my complex did have their lights on. 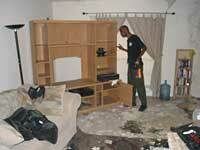 I couldn’t feel too sorry for myself though, after seeing the destruction of Robert’s apartment. Toggling the circuit breaker switches in my closet didn’t bring back power, so I dragged my mattress downstairs where it was several degrees cooler and spent a sweaty night in the living room. The next morning I felt rather foolish upon discovering that the main breaker switch for my entire apartment unit had been turned off at the box outside the building. It surprises me that these switches are so publicly accessible. Once power was restored, I could leave Macy in an air-conditioned apartment with no guilt. I left to help Robert load a pick-up truck bound for his temporary Houston apartment, and then headed over to Bonnabel. The Department of Education website had reported that Bonnabel was too damaged to open before the 2006-7 school year, but I was required to check in anyway and presumably declare my desire to remain employed by the Parish. A few administrators and teachers were present, and the assistant principal Mrs. Rush had some surprising news. Bonnabel might open on October 3 along with other Jefferson Parish schools! Two of the five main classroom buildings were condemned. Roof damage and the resulting flooding/mold would require major repairs. Also, plumbing was inadequate while Bonnabel was being used as a Katrina shelter, so trash and human waste contaminated the classrooms in at least one of the buildings. However, three of the classroom buildings, including mine, suffered only minor flooding and damage. We would just need to clean up enough to convince the school district that Bonnabel was safe to reopen. I spent a few hours hauling salvaged textbooks from a classroom to the theater, and then I visited Nat & Joan on the West Bank of the river. I hadn’t seen them in about a month, so we had a pleasant reunion. Their house was only slightly battered, and they were relieved to return home. With Nat’s paralysis and need for kidney dialysis, the evacuation had been especially challenging. Somehow they maintained their optimism and faith throughout it all. Most of the faculty returned to Bonnabel Wednesday morning, and of course we spent much time exchanging Katrina experiences. Since the air conditioning had been off for about 10 humid days, signs of mold were visible on most of our classroom walls. My classroom looked untouched, except for mold spots at several locations. We spent the next two days taking down our decorations and thoroughly bleaching all wall surfaces, desks, and floors. 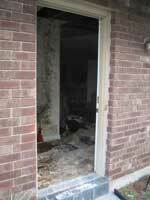 We were making good progress in preparing the school for reopening, but by Thursday afternoon, Hurricane Rita was threatening. By evening, it was upgraded to a category 5 (winds greater than 155 mph), and its course was creeping east towards the Texas-Louisiana border. As soon as I arrived at Bonnabel this morning, all who showed up were all sent home. Concern was growing, and fleeing a major storm once again became the topic of conversation along the gulf coast. Open to residents for only a few days, New Orleans again fell under mandatory evacuation orders. The eye of Rita is projected to be a couple hundred miles away, but even the expected local “Tropical Storm force winds” could further destroy the Crescent City. Mandatory evacuations have not (yet) been ordered in Jefferson Parish. The two friends with whom I had fled Katrina both have apartments in New Orleans (Now I’m especially glad I moved to Kenner). Nihar was able to briefly sneak into his “Midcity” area apartment, where he found only minor water damage at the base of the storage area/stairwell leading up to the second-floor living area. Michelle believes her apartment in the “Treme” area is fine, but has not seen it since before Katrina. The three of us had stayed at Michelle’s parents’ house in Spring, Texas for most of the Katrina evacuation. Now Rita is heading in the direction of Houston – just south of Spring. Fortunately Michelle’s parents are far enough inland such that the storm should significantly weaken by the time it passes their way. They should be relatively safe, but their home certainly cannot be a refuge for us this time. Almost two million along the gulf coast are being urged to evacuate, and all freeways near the Texas coast are jam-packed with people heeding the lessons of Katrina. Our other evacuation options in Baton Rouge (with Michelle’s friends) and Shreveport (with TGNO friend Sunday) have the advantage of being further inland, but they’re also even closer to the hurricane’s projected path. Our safe havens look not-so-safe, and we’re all fatigued from the temporary moves. We’re going to ride this one out. Nihar is staying with a coworker in neighboring Metairie, and Michelle is staying with me in Kenner. My place is well-stocked with non-perishable food and other emergency supplies. My apartment survived a hurricane, so I feel safe here for the tropical storm conditions that we’ll probably see early tomorrow morning. Included among the supplies are a half-dozen religious themed candles. They’re commonly sold in grocery store, and the stickers labeling the tall glass jars feature Pope John Paul II, Virgen de Guadalupe, Sagrado Corazón de Maria, etc. For some reason the religious candles are much cheaper than any other ones (perhaps God subsidizes them). We lit a bunch of them during our two-day stay in Baton Rouge with Michelle’s friends. Maybe this will become our corny hurricane tradition. Like last time, flooding is likely to be a bigger danger here than the winds. The failed levees during Katrina allowed much of the subsequent misery to occur, and now Rita’s winds have already breached two of those battered levees. Just days after some neighborhoods in Orleans were pumped dry, they’re again flooded with water (I’m soooo glad I moved out of Orleans). I also wonder if all the crapola placed out on the street after Katrina will get violently tossed around by the Rita winds. In spite of those concerns though, I still consider this to be a reasonable place to wait out the storm. Rita has presently been downgraded to category 3 (winds 111-130 mph), but is still considered an extremely dangerous threat along the Texas-Louisiana border. Here in Kenner, wind and rain have kicked up intermittently throughout the day. I’m being cautious here, but not excessively worried. We’ll watch some DVDs tonight and drink some girly drinks that Michelle bought at a gas station. We’ll all wake up tomorrow, perhaps after the storm has passed over, and hopefully find the electricity, phone, cable, and Internet all working. Then we’ll speculate on the next step of this adventure.